“Everything you think you know is wrong,” says Gabriel Mann, summing up Revenge’s upcoming fourth season in a single sentence. We initially asked the star to choose three words to describe what fans could expect from the show when it returns on Sunday Sept. 28, but he assures us any other explanation would not do justice to what’s coming down the pipeline. When we last checked in on our favorite Hamptonites, it seemed Emily (Emily VanCamp) and Nolan (Mann) had finally completed their ‘Revegenda.’ With the Grayson family brought low by a series of scandals, disappointments and bad business (all soured by Emily’s hand, natch), and with Victoria now languishing in a detention facility, what is there left for a reclusive billionaire and his favorite Gal Pal to do but throw a party? According to Mann, there definitely is a sense of accomplishment (albeit short lived) as the season kicks off. “I think we’re setting an unfair precedent for Nolan entrances in the first episode of each new season,” he laughs, when we compare last year’s dramatic parachute drop against the season premiere’s ‘bourne on a litter of sailors’ entrance by Nolan Ross. “As you will see come this Sunday his entrance is very much in keeping with this paradigm shift that has occurred. If fans take a closer look at those photos I think they’ll notice that Nolan is being carried into Grayson manor. And I think hawk-eyed viewers will notice that at the end of the season 4 preview released a while ago that it’s Emily standing on the balcony looking down. “We have a great freedom this year because with Emily having quote unquote gotten her revenge the playing field is wide open. There’s been a total role reversal and paradigm shift in the story at this point. Emily’s gotten her revenge which leaves Victoria in a very dark and very bad place. But remember, going all the way back to the origin of the story is the idea that when you embark on a journey of revenge, dig two graves,” he hints. And speaking of graves, the show is set to up the ante this year with the presence of David Clarke (James Tupper), Emily’s thought-to-be-dead father and the inspiration for her twisted desire for vengeance against those who wronged him. With Daddy Clarke back to stir the pot we can’t help but feel excited for what’s to come on several fronts. “I’m on that train with you,” agrees Mann. “It’s such an interesting story engine, and a powerful one. It’s one that has driven the show behind the scenes from day one. It opens up a world of unexplored potential and story lines. But as we always say on this show, a story is never quite what it seems to be, and before you know it you are deep down the David Clarke rabbit hole. It’s kinda what I’m calling it this year,” he laughs. However Mann agrees that for Emily and Nolan the revelation will come as the greatest shock. “In some ways there is very much a sibling relationship between Emily and Nolan,” he explains. “David is a father figure to Nolan in addition to being Emily’s father. The fact that they have been so lazer focused for the last three years on everything David Clarke related, and now all of a sudden you have the real man is standing right in front of you, makes for some very intense and dramatic situations and the possibility for a lot of fun for the audience. And for those clamouring for more on Nolan and Emily’s unique partnership? For all the stunning changes and reveals this year, Mann is reluctant to refer to the season ahead as a reboot. 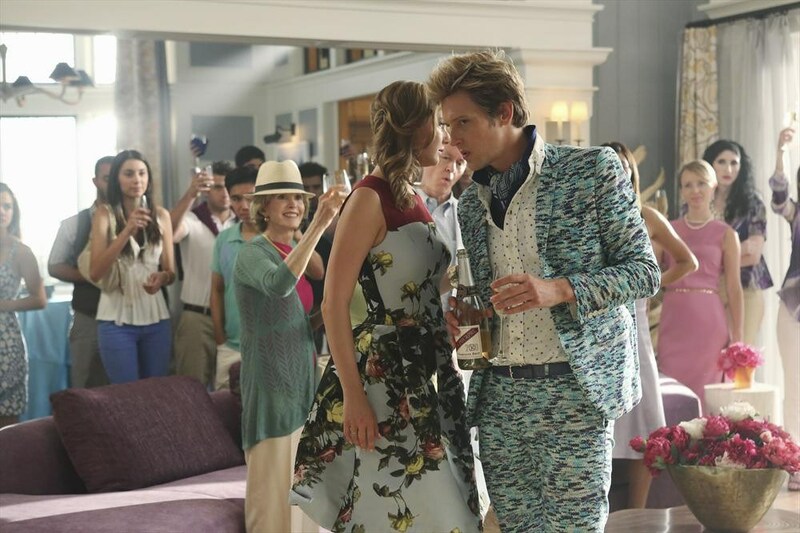 Catch Gabriel Mann as Nolan Ross in Revenge’s season 4 return Sunday Sept. 28 (10:01-11:00 p.m., ET) on ABC. Follow @ScreenSpy on Twitter | ScreenSpy on Facebook for more Revenge scoop and interviews this Fall. REVENGE “Burn” Sneak Peek: Victoria is Attacked, But Who is to Blame?